I continue not to understand this on the merits or as strategy. A five-year-old could pinpoint the substantive problem with it: If you add a few justices to the Court to tilt it your way ideologically, the other party will respond in kind as soon as it has the chance. Democrats recently received a painful lesson about what happens when you start playing with norms surrounding judicial nominees, like removing the filibuster for lower-court nominations. Strange that they’d want to play with another one, especially one that even Franklin Roosevelt couldn’t break without public condemnation. I don’t get it strategically as a motivator for 2020 turnout either. Democrats’ Court-related motives to turn out next fall are already abundant. They haven’t put a new justice on SCOTUS in nearly a decade, they’re spoiling for revenge for Merrick Garland, they’re disgusted by Brett Kavanaugh and Republican defenses of him, they’re terrified of Ruth Bader Ginsburg’s delicate health. Lose Ginsburg’s seat to a conservative and it could be 25 years before Democrats have a majority again. It’s Republican voters who may need a little goosing to get excited about the Supreme Court in 2020. Trump’s already appointed as many justices as any president since Reagan. He’s filled, and continues to fill, the ranks of lower federal courts with young conservative appointees. Losing the chance to appoint Ginsburg’s successor would hurt but we’ll still have a right-leaning Court even if that seat goes to a Democrat. GOPers obviously want to keep their judicial momentum going but the difference between the right and left on this issue is the difference between a man who’s just finished a big meal and a man who hasn’t eaten for a week each eyeing a piece of cake. They both want it. But one needs it. 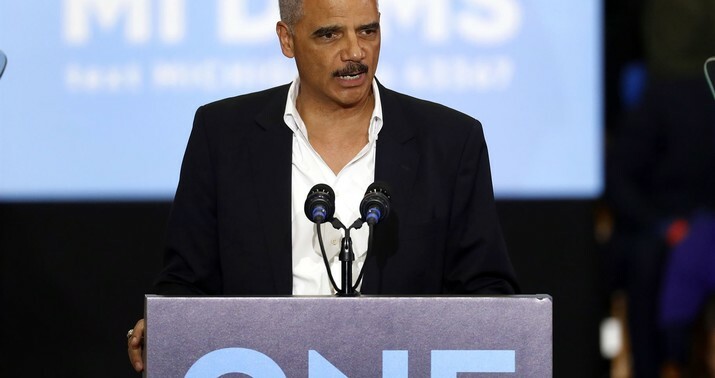 I can’t find video of what Holder said, which is too bad as it would have made for a great GOP attack ad next year. That’s okay, though — one 2020 candidate, Pete Buttigieg, has already affirmed that this idea should be on the table while others, especially those like Elizabeth Warren whose chances depend on the left, will surely fart out some vague approving noises about it as the primaries roll on. This will be a sort of litmus test, less strictly ideological than a test of fortitude and resolve. Are you willing to fight fight fight and do whatever it takes to advance this progressive revolution? Yes, the candidates will say. Of course I will! And then the issue will quietly disappear before the general election. Just like the chitchat right now about reparations, in fact. Two further points. One: The size of the Court isn’t set in the Constitution so it could be expanded without an amendment, by simple legislation. But no Court-packing legislation is passing the Senate without 60 votes, needless to say, and no Republican is voting yes on a Dem-led Court-packing scheme under any circumstances. If Schumer wants to explode this norm, he’ll first have to explode the norm that allows the Senate minority to block legislation via filibusters. If he does, that will also be used against him and his party in the future when circumstances allow, to their great misfortune. Two: The one thing that might force the Democratic nominee to take this idea semi-seriously next year is if a Democratic Supreme Court seat were to become vacant in the spring and McConnell refused to follow his own Garland rule of holding the seat open until after the election, to let voters decide which presidential nominee will fill it. If he and Trump filled the vacancy immediately, Democrats would be so outraged by the hypocrisy that Court-packing might move from fringey litmus test to a semi-serious proposal about the bare necessities to restore equitable treatment in SCOTUS appointments. Although, ironically, that might make McConnell even more likely to follow through on filling the vacancy: As I said, a strong Court-packing push by Dems will benefit Republican turnout more on the margins than it will Democratic turnout. McConnell might get to have his cake appointment-wise and eat it too.